The story of the Secure Fence Act is a perfect example of why so many Americans distrust their government. The news is filled with images of migrants massing at the U.S-Mexico border in California. Why haven't they been able to enter the United States? Because a physical barrier prevents them from doing so. It is just another example of a barrier — a fence, a wall, whatever — providing real border security. Of course, building a wall on the U.S.-Mexico border was President Trump's premier campaign promise. So far, in nearly two years in office, he has made almost no progress toward making it happen. Trump has had opportunities to win wall funding in exchange for amnesty for recipients of President Obama's Deferred Action for Childhood Arrivals, or DACA, policy. But the White House loaded its wall proposal with add-on demands, and it never happened. Building a wall would cost an estimated $25 billion. Trump often says that he has already gotten $1.6 billion to start work. But Congress has specifically dictated that most of that money not be used for the president's wall. 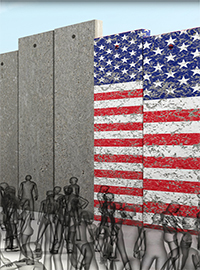 Some of it can be used to build new fencing — not the wall designs that the administration has tested — while other money is restricted to the replacement of existing fencing. First, understand the problem. In California, the migrants are targeting a part of the border where there is a barrier. But much of the border's 1,954 miles remains uncovered. According to the Border Patrol, 354 of those 1,954 miles are protected by what is called pedestrian primary fence, which is a single-layer fence. Another 37 miles are pedestrian secondary fence, that is, double-layer fencing. And 14 miles are pedestrian tertiary, or triple-layer fence. In addition, 300 miles are covered by vehicle fencing, which will stop a truck but allow anyone to walk through with no problem. That is a total of 705 miles — 405 miles of some kind of pedestrian fencing and 300 miles of vehicle fencing. The act was passed by big, bipartisan majorities in 2006, receiving 283 votes in the House and 80 in the Senate. It required the federal government to build reinforced fencing, at least two layers deep, along about 700 miles of the border. It specified areas in California, Arizona, New Mexico and Texas where fencing would be installed. If the law had been followed, many vulnerable parts of the border would now be secured. But the very next year, 2007, after Democrats won control of the House and Senate, Congress amended the Secure Fence Act. The amendment said that "nothing in (the original legislation) shall require" the installation of fencing if the government determines that a fence is not the "most appropriate" way to secure the border. What the president needs is money, and that has to come from Congress. Of course, Democrats won't want to give it to him. But if Trump called for an appropriation to fund the fence, he would at least have a new argument: Democrats have already voted for it. And not just illustrious Democratic former senators like Barack Obama, Joe Biden and Hillary Clinton. Democrats in power now, too. Obviously, the Democratic Party has moved far to the left on immigration in the last 12 years. Many, if not all, of those Democrats would now oppose what they once supported, especially if Donald Trump wanted it. So any fight on a border barrier would be uphill for the president. But masses of migrants are pushing toward the border. And even when the caravans are gone, illegal crossing of the border is still common. There is a law on the books that could strengthen border security. Why wouldn't the president try it?